After several years of development, The Weinstein Company is finally moving forward with Bad Santa 2, and now the cast is coming together. The Wrap is reporting that Kathy Bates has signed on to portray the mother of Billy Bob Thornton's Willie Soke in the upcoming comedy sequel. No details have been released about her character, or how she fits into the story at this point. We reported last month that Bad Santa 2 will hit theaters in 2016, with production scheduled to begin this January in Montreal. Very little is known about the story at this point, but Kathy Bates' character is described as a "foul-mouthed" woman. The Wrap also reports that original Bad Santa stars Tony Cox and Brett Kelly will reprise their roles, but it isn't known if Lauren Graham or Lauren Tom will be back for this follow-up. Mark Waters (Mean Girls) is directing from a screenplay by Doug Ellin, Johnny Rosenthal and Shauna Cross. Geyer Kosinski and Andrew Gunn are producing, with Mark Waters and Doug Ellin serving as executive producers. The original Bad Santa earned $76.4 million at the box office from a $23 million production budget. Miramax will partner with Broad Green Pictures to co-finance and co-produce. Broad Green will distribute Bad Santa 2 theatrically in the U.S. during the 2016 holiday season. Sierra/Affinity will handle foreign sales with sales starting at the upcoming American Film Market earlier this month. With production starting in just a few months, hopefully we'll hear more casting news in the very near future. Oddly enough, the 67-year-old Kathy Bates is only seven years older than her on-screen son, Billy Bob Thornton. 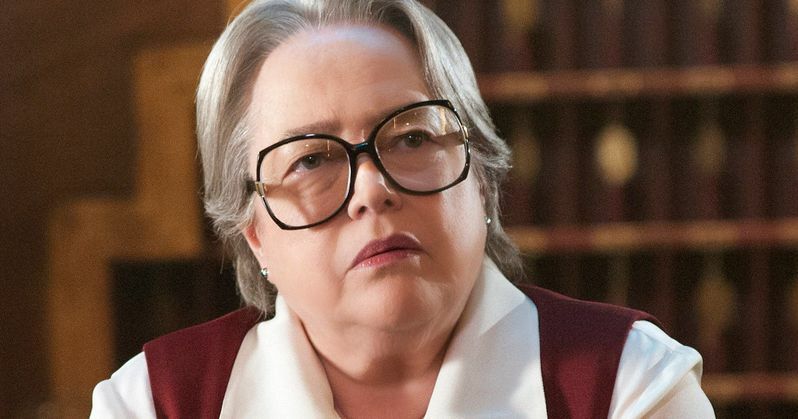 Kathy Bates currently stars on FX's American Horror Story: Hotel, and she will next be seen in The Boss, alongside Melissa McCarthy, which hits theaters on April 8, 2016. Do you think Kathy Bates is the perfect choice to play Billy Bob Thornton's mother in Bad Santa 2? Let us know what you think, and stay tuned for more casting details.